To be successful it takes dedication and commitment to team work. L. Feriozzi has built relationships that serve it well when it comes to bringing the best resources to bear on every project. All of the family members currently involved in the business maintain current union memberships in various trades, including Cement Masons Local #2, Carpenters and Joiners Local #255, and Operating Engineers Local #825, each bringing their own specific expertise to the project. As L. Feriozzi moves into the future, they continue to expand their staff and capabilities to further expand their role on larger General Construction projects. Project Executive James Simpkins leads this division of the company with over 30 years experience in a variety of major construction projects in the region. His continued relationships with designers, consultants, subcontractors and approving agencies are instrumental in the success of projects. ($50 million) A 337-room hotel tower renovation along with renovation and fusion of two existing hotels into one facility. ($78 million) A 3200 car parking facility and casino expansion. ($7 million) Renovation and expansion of a 75,000 S.F. facility including health club, fitness center, pool, gym, offices, and daycare. ($11 million) Historic renovation of an existing 3-story building (18,000 S.F.) including demolition of two existing schools and associated site improvements. ($24 million) A 13-story 1200 car parking facility and Casino expansion. ($100 million) A 1000-cell short-term prison facility. ($110 million) A 1000-cell state correctional facility consisting of 24 buildings over 340 acres, including inmate housing, recreational, medical, dining, educational, visiting and other support facilities as well as a 1,000,000 gallon water tower, a sewage treatment plant, staff residences and a chapel. ($22 million) Expansion of an existing high school including classrooms, library, and cafeteria. ($142 million) Casino/hotel including a bowling alley, theatre, and 7 restaurants and kitchens. ($22 million) Historic renovation of the existing convention center. ($152 million) Casino/hotel including restaurants and kitchens. ($4 million) A lightweight block manufacturing plant. ($25 million) 3-story Casino expansion, retail and meeting space constructed above an active street. ($3 million) Addition of 3 floors on top of an existing historic hotel adding 5 high-end penthouse suites. Former Jewish Federation; Philadelphia, PA.
($54 million) Concurrent renovation projects within single facility including renovation of 500-room hotel tower, 75,000 S.F. of casino space, 5 restaurants, the hotel lobby, and the exterior. ($60 million) A 600 cell addition to existing facility. ($80 million) Construction of a 300-room Casino/Hotel Tower addition. ($135 million) 500-room expansion of an existing casino/hotel including an indoor amusement park complete with Ferris wheel and roller coaster. ($92 million) Casino/hotel renovation and expansion. The firm is an active member of the Building Contractors Association of Atlantic County. They are also members of the Building Contractors Association of New Jersey. L. Feriozzi is fully licensed and classified by the State of New Jersey as a General Contractor. The company is rated by the N.J. Department of Transportation (NJDOT) for projects of up to $100,000,000.00, by the N.J. Schools Development (NJSDA) for up to $81,000,000.00, and the N.J. Treasury, Division of Property Management and Construction (DPMC) for up to $81,000,000.00. The Company is licensed as a Home Improvement Contractor by the N.J. Division of Consumer Affairs, holds a N.J. Casino Control Commission Service Industry License, and an Atlantic City Contractor’s License. 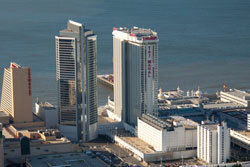 From the early days of Atlantic City, the Feriozzi family has been instrumental in its growth. It was only natural that when the buildings started reaching for the sky so did L. Feriozzi. Concrete construction takes manpower, and with the current President, Joseph L. Feriozzi, a member of the Cement Masons Local #2, getting quality craftsmen is a matter of pride. L. Feriozzi can easily focus their energies and experience on the concrete aspects of a project whether self-performing the concrete work as part of a General Contract, or working as a Concrete Subcontractor for others. At L. Feriozzi quality and integrity are more than goals. We strive to live up to the standards set early on and are committed to making sure we can be proud of every project no matter what the size. ($35,131,124) – Subcontract to Bovis Lend Lease LMB, Inc.
($968,031) –Subcontract to Baumgardner Construction Company, Inc.
($266,803) – Subcontract to Turner Construction Co.
($13,000,000) – Subcontract to Perini Corporation, Framingham, MA. ($11,872,000) – Subcontract to Perini Corporation, Framingham, MA. ($3,329,600.00) – Subcontract to Bovis Lend Lease LMB, Inc.
($111,775) – Subcontract to Baumgardner Construction Company, Inc.
($107,250) – Subcontract to the Delta Organization, Inc. 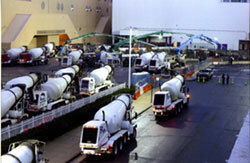 Since many of the roadway and transportation projects utilize concrete heavily, it was a natural fit for L. Feriozzi. Once again, L. Feriozzi not only can provide the concrete work but can manage entire boulevard streetscapes. By assuming the General coordination of all of the various subcontractors including, concrete, paving, utilities, landscaping and site furnishings, they can provide a complete package to Owners and Designers. L. Feriozzi has the added advantage of having a materials recycling facility, the concrete removed becomes the sub base for new roadways keeping the project environmentally neutral and reducing costs. ($197,135.00) - Subcontractor for Arthur R. Henry, Inc.
($214,932.00) - Subcontractor for Arthur R. Henry, Inc.
($1,328,765) – Subcontract to A. E. Stone, Inc.
($735,852) – Subcontract to A. E. Stone, Inc.
($102,737) – Subcontract to A. P. Construction, Inc.
($560,145) – Subcontract to A. P. Construction, Inc.
($634,739) – Subcontract to Arthur R. Henry, Inc.
($732,908) – Subcontract to Joseph Jingoli & Son, Inc. Recycle and renew is the big focus within the construction community and is a key component of LEED Certification. L. Feriozzi can assist in this process as a New Jersey Certified “Class B” Recycling Center. Concrete and asphalt can be removed during the demolition phase of a project and recycled to become useful materials for such things as roadway base. This is a large savings to a project owner, not only in expense, but also in the elimination of possible project delays due to materials issues. Solar energy is another of the Green capabilities that L. Feriozzi possesses. They can build a team of experts that can handle a complete project. From design to installation, L. Feriozzi has the capabilities to walk you through the process and have you living off the grid in no time. Renewable energies are most cost effective and there are more incentives to go green than ever before. Solar energy systems are being installed on parking facilities, commercial properties, industrial locations and even residential properties. ($580,709.00) - Subcontractor for Arthur R. Henry, Inc.
($347,300.00) - Subcontractor for Arthur R. Henry. Inc.
($255,800.00) - Subcontractor for Arthur R. Henry, Inc.
($432,889.00) - Subcontractor for Arthur R. Henry, Inc.
($1,631,380.00) - Subcontractor for Arthur R. Henry, Inc.
($1,681,598.00) - Subcontractor for Arthur R. Henry, Inc.
($1,912,359.00) - Subcontractor for Arthur R. Henry, Inc.
($820,530.00) - Subcontractor for Arthur R. Henry, Inc.
($189,614) – Subcontract to Joseph Jingoli & Sons, Inc.
($56,100) – Subcontract to Joseph Jingoli & Sons, Inc.